Beware! The menu contains a lot of corn and cheese. Not as ingredients, but as bad puns. However, once you adjust to the quirky humour, you’ll settle into the lighthearted vibe and, more importantly, you’ll notice the amazing food on offer. 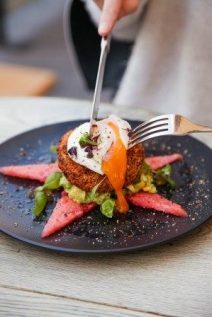 Spilling out from a beautifully refurbished building into the square outside Newtown Railway Station, Cuckoo Callay has a relaxed, village feel. Fur babies are so welcome they even have their own menu items. But back to the food. The owners are big on sustainable sourcing and making things in-house. They are also very big on bacon. During the Bacon Festival (it’s a thing!) they create a magnificent bacon themed menu. Their regular menu, though, has lots of vegetarian and vegan options. Here’s a menu item that epitomises the humour, create ingredient styling and versatile dietary options the typify this very cool cafe: One Flew Over The Cuckoo’s Nest (v): Sautéed broccolini, baby kale, fresh peas and snow peas, with wild grains, spicy chermoula, herbed labnah, activated almonds and 63° poached egg (Add cured salmon +6).